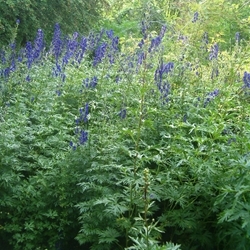 In the world of herbs, there is simply nothing that represents life and death like Aconite (Aconitum carmichaelii), which is also known as Wolfsbane or Fu Zi, among many other names. On one hand it is so poisonous that improper use can cause human respiratory paralysis, cardiac arrest, and even death. In fact Wolfsbane has been used in poison tipped arrows and deadly concoctions for thousands of years, appearing famously in classical works of fiction to modern day cinema. While the weapons experts of their day took advantage of Fu Zi’s deadly nature, herbalists, from traditional Chinese medicine and Ayurveda to Greek and Roman medical practitioners like Theophrastus, Dioscorides, and Pliny the Elder, came to regard Fu Zi as the most essential of medicinal herbs. According to studies, the frequency that Fu Zi used in Chinese herbal formulas is over 13% - that’s every condition, every symptom, every ailment. 13% of the time this herb is found to be helpful. That number helps explain the name “King of the 100 Herbs” ascribed to Fu Zi in Chinese Medicine. Because of the toxicity of the herb in the raw state, it is the preparation that makes this herb usable and brings out its superlative healing properties. The right type of Fu Zi only grows in Jiangyou in Sichuan province.“ This type of Fu Zi is called specifically Hai Fu Pian, meaning it is cooked and prepared in a specific way to remove toxicity and make it suitable for use. Hai Fu Pian is Fu Zi prepared in such a way that the color turns dark, or black. The method or preparation involves first soaking the whole herb in brine for several days. The herb is then boiled in the salt water until it is soft through to the core (about 4 to 6 hours). When the cooking process is completed,the herb is rinsed and sliced. After this the herb is quickly stir-fried in vegetable oil and brown sugar until the color turns dark brown. It is then removed from the heat and baked until the external surface develops an oily sheen. Finally it is dried and set to package for distribution.